In part one we looked at what predators are instinctively programmed to recognise as not only prey, but easy to capture prey. The most gain for the least effort, banking on the sure thing, minimising wasted effort, are the cornerstones on which pike, salmon, and trout approach obtaining food. With the evidence in the photograph of the trout with the fry imitating fly in its mouth, it is not too hard to agree with the Vulnerable Prey Image theory, as it is easy to imagine our predatory trout launching the attack on our fly as we jink, stutter, or maybe wobble it during our retrieve. The application of the theory gets a little harder to visualise, and more complex, when we try to apply it to trout feeding on insects. In the Vulnerable Prey Image (Part 1) we have looked primarily at predatory behaviour, when fish such as trout and salmon target bait fish, or fry. 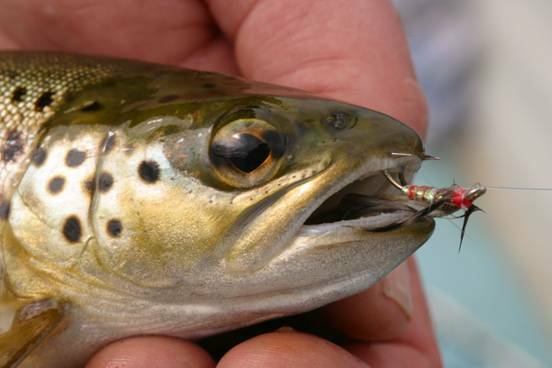 This involves the predator in actively chasing, and aggressively capturing the prey, but trout are not only aggressive chasers, as their survival demands they be flexible enough to adapt, and maximise their feeding opportunities to include a wide variety of food items. Trout feeding in rivers often hold their position, and allow the current to bring their food to them. This type of feeding behaviour can probably be best described as static harvesting, or interception. The principals of predatory behaviour are still being adhered to by the trout in this situation, as they are using the energy of the current to bring food to themselves, and are obtaining food for little effort. It is a little harder however, to accept the concepts of predatory behaviour, and the vulnerable prey image, when we try to apply other principals, such as-banking on the sure thing?, easy to capture prey?, why is this food item/nymph/ insect a sure thing?, what is it about this insect that makes it look vulnerable, and easy to capture?, what triggers the trout to target certain flies as they swim over them?, why do small trout seem to target everything that passes over them, but larger trout seem to be more selective? . In trying to come up with answers to these questions, we must take into account that when we present our dry flies to rising trout, we must as a rule try and achieve a drag free float, in other words our fly must swim totally naturally downstream at the same pace as the water current. (The exceptions to this rule would be when imitating some species like caddis/sedges which can often skitter across the current flow) We are now unable to add any physical techniques to enhance the Vulnerable Prey Image of our fly, so we must rely heavily on fly design, and any properties that we can incorporate into that design, to enhance the image of vulnerability. Dry flies in all the various styles we have at our disposal today are the product of many years of observations on trout feeding, analysis of trout stomach contents, and the inventiveness of clued in, observant anglers translating all this into new fly designs at the fly tying bench. Frederick Halford was born into a wealthy Jewish family of German ancestry in 1844 in Birmingham, England. He is generally recognised as the father of modern dry fly fishing, and was part of the upper class elite which had privileged access to the best trout fishing on the famous English chalk streams. Halford along with this privileged elite encouraged a very narrow view on what they thought fly fishing should be about, and especially dry fly fishing. The dry fly fished only upstream, and only to trout that were actually rising was the order of the day. This dogmatic, so called purist approach was also held to be the most sporting way to fish for trout and to a certain extent lives on to the present day. Even today we occasionally hear statements like- the dry fly is the pinnacle of sportsmanship, or that it takes more skill to fish dry fly. 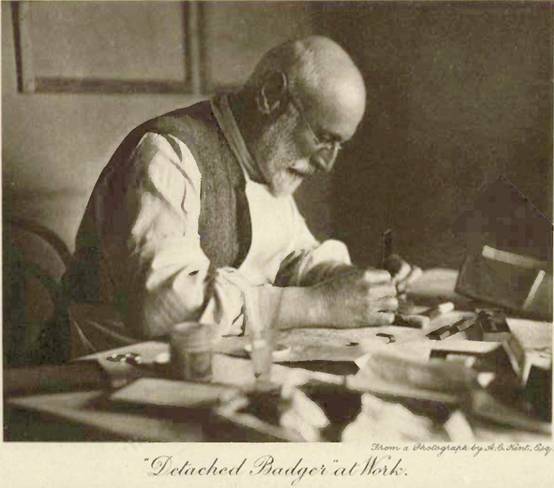 Mr Halford may have been a little too dogmatic, and elitist, but he did help to start a much more sophisticated approach to tying artificial dry flies, and was one of the first to try and tie exact imitations of the natural insects hatching on the chalk streams. This exact imitation school of dry fly angling eventually widened its scope in later generations to become what is now known as-Matching the Hatch. The insects Halford was trying to imitate were mostly upwing flies, and it was the fully hatched dun resting on the surface that received all the attention. The almost total disregard for the different stages of emergence of these upwing flies prior to the fully hatched dun stage, was probably the greatest failing of the Halford era, and because this total focus on the fully hatched dun was reinforced in Halfords own books, it became the gospel to follow for other writers, and anglers, even many years after Mr Halford’s death. Before we continue in our study of the history, development, application, and importance of fly design, as it applies to, and enhances The Vulnerable Prey Image, we might just take a quick look at the reality of why all this stuff is so important. 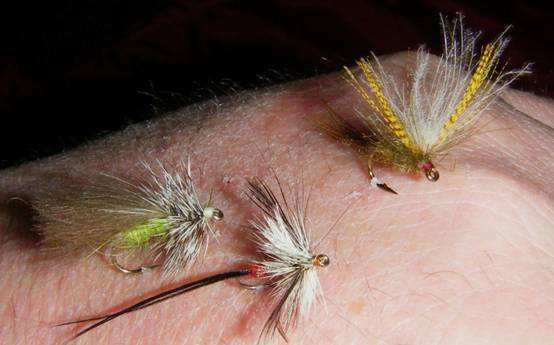 One of the first things that a beginner has to get to grips with is which fly to use, and why. As our knowledge and experience grows, we start to become more observant about what is really occurring as trout feed in front of us. We start to become aware, and interested in all the various stages in the life cycle of the insects that trout feed on. This study of the life cycles of insects is very interesting in its own right, and we don’t have to get too wrapped up in all the Latin names and terminology, we just need to acquire a reasonable working knowledge of the insects where we fish. There are many variables involved, with even the most experienced anglers occasionally reading the signals incorrectly, and choose the wrong fly design to match the specific stage of emergence of the natural. You see I have emphasized the term – wrong fly design-, as opposed to saying the wrong fly, because I believe it is the design of the fly and where sits in relation to the water surface film that often makes the difference between success, and failure. 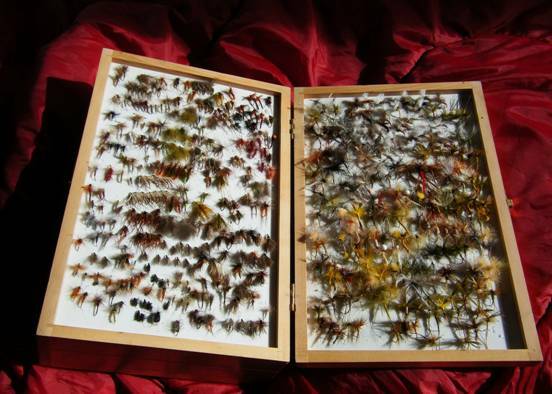 A selection of dry flies for the loughs-but how do we chose which one to use? Before we try and answer some of the questions asked earlier in this article. It might be good to have a look at some relevant aspects of trout feeding behavior. Small hungry trout have to learn what is edible and will have a go at almost anything that floats over them. This trial and error feeding routine becomes less prominent as our young trout gradually learns and becomes more competent. Our trout also learn to use their energy wisely when harvesting this food, so as to maintain a positive balance in favor of the energy gained from the food, versus the energy expended in obtaining it. Trout feeding behavior is partly learned along with being partly genetically imprinted from previous generations of successful members of the species. Large trout don’t get large by chasing, or harvesting prey items which are too small, or which are available in insufficient quantities. They hone in on insects that they know are in trouble, crippled, stuck in the surface film, drowned, struggling to emerge , or are being battered into the water surface through wind ,and rain. All these unfortunate insects will create a particular image of vulnerability, depending on each situation, and it is up to us to provide the correct illusion with our flies/presentation, which might incorporate such triggers as, attached shucks, jumble of tangled legs, wings horizontal in the surface film, among others. Also the flies position on, in, under, or penetrating the surface film is very important. Even if we wanted to, we cannot tie an artificial fly that is a perfect copy of a natural fly. Even if we could it would not be a major advantage to us because then our perfect imitation would just look like all the other natural flies when we fish and our perfect imitation would be just one in the crowd. Big trout are often looking for flies that are showing signs of Vulnerability and that means flies that are less than perfect. 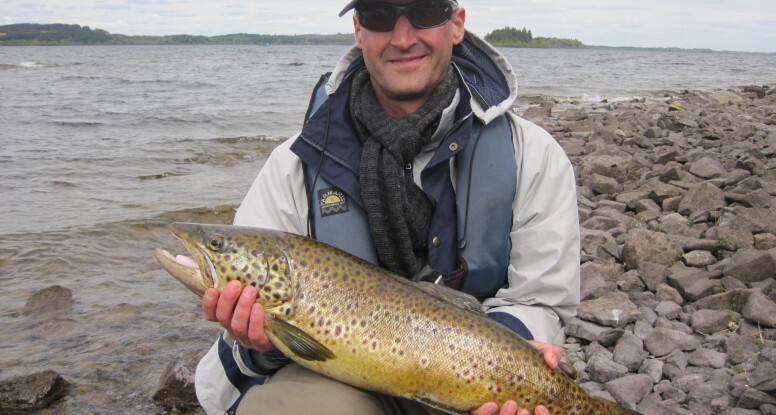 If you go to any river or lake on any given day during a big hatch you will meet many successful fly fishers who were actually using quite different flies. The reason they were successful was not because they were fishing with perfect imitations of the natural fly, but because they were fishing with imperfect copies of the real insect, but their flies must have had a few good trigger points that portrayed the illusion of Prey that was Vulnerable in some way. 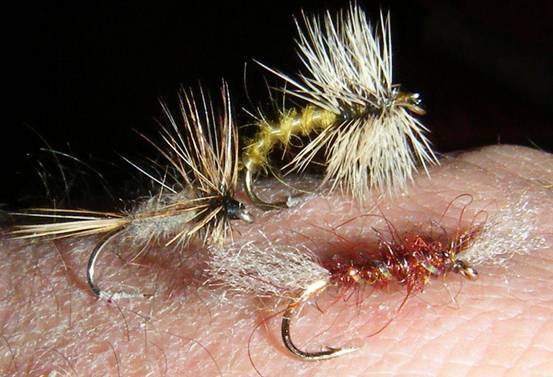 We all have heard of the local fly fisher that catches lots of trout but sometimes the flies they tie don’t look great or as some might say – look scruffy!- well take my advice, and if possible, politely ask these successful fly fishers for second look into their fly boxes! One of the greatest dry flies ever invented The Grey Duster seen here on the left. 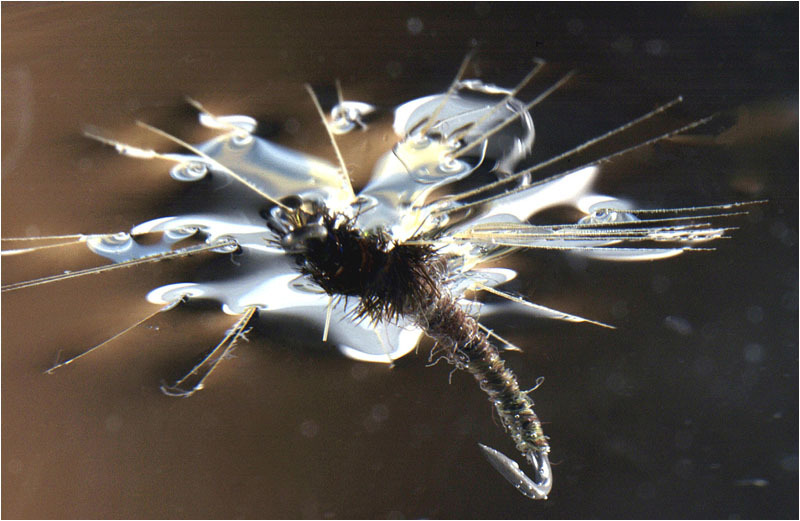 This one has had its hackle clipped underneath to let it fish flush in the surface film, imitating a trapped insect. If the hackle is left as normal (fully wound), then it will fish more on the surface. The fly at the top is a Mc Carthy Buzzer. Extra turns of hackle in this pattern allow it to be fished right on the surface, imitating a female buzzer laying her eggs, and any light breeze will make it tickle about a little, mimicking the swirling action of the female. In calm conditions a gentle stutter of the rod tip will move it just enough to draw attention. The Shipmans Buzzer is our third fly. This fly was designed to represent a buzzer hatching, right in the surface film, a position, and period of emergence that screams vulnerability. 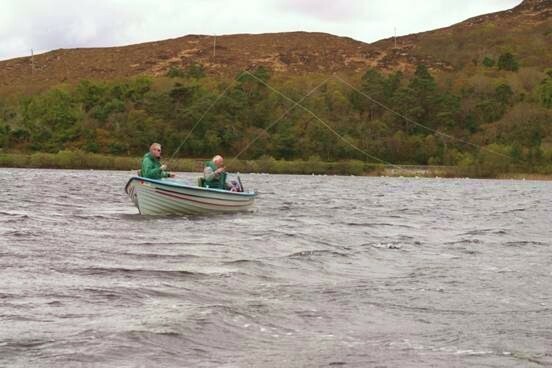 If this fly is being fished correctly (well sunk in the film), it should be difficult to see. Some anglers find this inability to see their fly as a handicap, but don’t worry; you just need to sight down along your floating line and imagine approximately where you think your fly should be and you will be right most of the time. Even if you are not exactly accurate in your calculations you will always see the rise! . The top fly is a pattern called Bobs Bits, invented by Bob Worts, and once again it is meant to be fished well sunk in the surface film. The second fly, with its knotted pheasant tail legs trailing back, and down is a Bristol Hopper. A super fly that can represent hatching buzzers, terrestrials, or olives, all we have to do is vary the size, and colour. 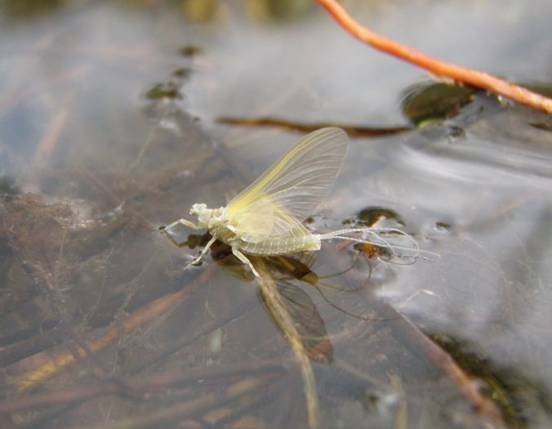 The simplicity of these hugely successful patterns goes a long way in proving the theory that trout are only looking for 2-3 triggers when targeting insects near the surface. 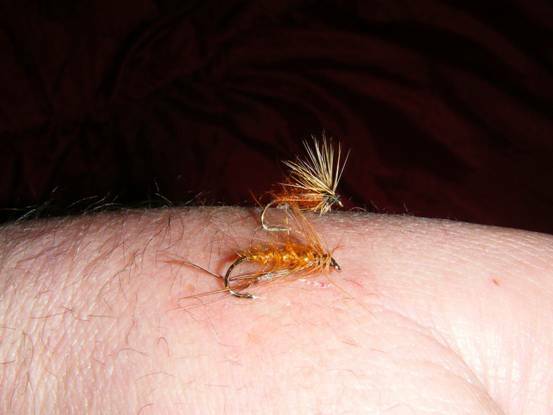 Some of the triggers incorporated into these simple to tie flies are-translucency by using seals fur in the bodies, sparse insect like profile, sparse undercut hackle to let them fish flush in the surface film, knotted legs representing either emergence,, crippled emergence, or pupal shuck, colour matching the hemoglobin that the natural buzzers pump into their wings as they hatch, but most of all it is the design of the fly which allows it to be fished in the insect trap that is the surface film, and creating that Vulnerable Prey Image. On the right we have a mayfly dun incorporating cdc, and without any hackle underneath, especially good in calm conditions, where delicacy of presentation is crucial. The sedge fly on the left is well hackled, and has a substantial cdc wing, making it a specialised weapon when we want to create the fish attracting vee wake that large natural sedges make as they scurry around, or when swimming strongly for the safety of shore. The design for function being probably more important than, say colour. There are few Vulnerable Prey Images which advertise their presence so openly as sedges furrocking around in the fading light of evening time. Our last fly is a spent mayfly pattern, with its outstretched wings tied in a final delta shape of total submission. The ultimate in vulnerable design, a fly that the trout knows is dead or dying, and will never escape Trout Heaven !. The fully hatched dun is of course taken by trout, and it is always wise to have some in your box, but often it takes a heavy hatch before the trout will become totally locked onto them. Most trout that will take a dun imitation will also take an emerger pattern, but trout that are zoned in on pre dun stages, will very often totally ignore the fully hatched fly. There have being many elements on the history of fly design, trout behavior, and general dry fly technique that I have had to omit in this article, but then the main focus was on trying to emphasize the importance of , and the application of the concept that is vulnerability. All successful dry fly anglers have the same attributes in common, and they are, correct choice of fly design to match what the trout are actually feeding on, delicate, and accurate presentation, along with the ability to accurately gauge what amount of movement to impart to the fly if any . If you have enjoyed this article please share it with your fishing friends on Facebook.